Making a dog training DVD can be a complicated process. Having the dogs that you need at the correct level of training when you are ready to shoot the video is the hard part. If you are going to show the actual training, then you need to film the dogs when the training is happening. Most videos don't do this. They film dogs after the training is complete. You end up with a product that shows the trained dog instead of the training process. It's not what the customer wants to see and it does not give a true picture of the process, warts and all. We did not want to do that with this project. We wanted several dogs that had zero training so we could show you how fast you could take them through the process, from the introduction of the e-collar to off-leash control in real-time. Robin's idea was to take three dogs from shelter backgrounds and put manners on them as fast as possible. She also wanted to film the entire process. Grace, Brandi and Bonnie each came with their own particular issues as you will see in the early sessions. For the next three weeks, we filmed the entire training process of each dog's training, and show you every step along the way. There are many ways to train dogs and many different ways to use the remote training collar. Robin's training methods are easy to understand for the dog and the trainer. "Robin is a true pro and is helping so many people and dogs." Well done, and will go home with all my clients. Robin is a true pro and is helping so many people and dogs. "This clearly illustrates what to look for when first introducing an E-collar, as well as how to find the right level, and most important, what to do when the dog gives you a bit of a challenge." 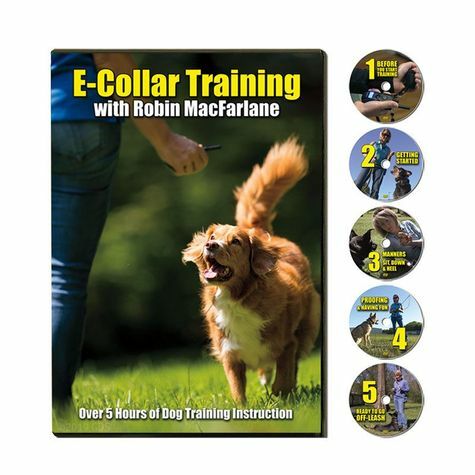 Excellent teaching DVD showing how to PROPERLY use an E-collar with all kinds of dogs. This clearly illustrates what to look for when first introducing an E-collar, as well as how to find the right level, and most important, what to do when the dog gives you a bit of a challenge. The B and W replays are superb, as well as the green button showing precisely when the stim is applied. EXCELLENT WORK!!!!! The information was presented in a methodical and easy to understand manner. It was good to be able to see a segment, try it, review it again and move on as my dogs responded. As a beginner with an E-collar, I found the video as an excellent resource, Very helpful and informative. It was a bit slow, but the info was solid. Specifically setting the intensity of stimulation to "match" your dog and how to condition your dog to respond to commands using the e collar. Good Work! I found the DVD interesting and educational. I liked it a lot. I am a new dog owner and I found this DVD so very helpful. It was very helpful and made it easy to use. The Ecollar video gives you a great perspective of how to begin and continue using it correctly. My dog is now 10 months old and although she wears the collar a lot, I do not have to activate it too much. She is not at all afraid of it and when we put it on she knows that we are going to have fun. It reaffirms what I use the collar for. I only use it to reinforce my wirehairs to hunt close. I mainly use them for grouse, woodcock, and pheasant. Grouse don't hold very well as you already know. A very nice product, and works as advertised. The instructional DVD was very helpful. For training my pup, I had never used a collar such as this. Now, I will never be without it. A superior product that I will always have. Nice job by Steve and Robin! Easy instructions and great service, Thank you. Excellent advise for the beginner. It made possible the instant use of the collar. My French Brittany is a very independent dog and the Ecollar has provided the 'long distance' leash capable of reinforcing instructions beyond the useful range of the physical leash. That is, he darn well knows when he is off leash. Loved the green dot that showed the button pushes and you could really tell what was going on and the reaction of dog. Very good, Learned a lot even though I have been using electronic collars on my hunting dogs off and on for 30 years. Very good advice and instruction for beginners. Great video but would have liked to see more on some basic commands like "whoa" and retrieving commands used in the field. I really like the simplicity in understanding the instructions. I used it, and it worked very well. My husband wasn't sure about the idea, but now he loves it because it has helped keep our dogs safe from danger because they come quickly when called. It's a great training device, and very little stimulation was required. I appreciate the help in the video! Video was very easy to follow and made training a fun experience. My Labrador responded well and learned commands quickly. I would recommend this video. Made the process clear and easy! It covered how you train your dog in a fashion that anyone can understand both by talking and showing. This is a very helpful video. Even if you understand how dog training works, this video will help you with many small tips and tricks to making training easier. I was very comfortable using the training collar after watching the video prior to putting the collar on my dog. I like all the features and capabilities. I have an 8-year-old lab and 2 of her pups that are two. The DVD is excellent and this has been my first experience with e collars. Robin's explanations are very good for all of the sessions. I have recommended it to others many times. I was new to training with an ecollar and I was looking for some guidance. This DVD was just the ticket. It was easy to follow and made learning easy. I recommend this to all newbies. Very easy to use an amp compact, great to use hunting, a great tool to keep your dog safe. I think it would be very easy to misuse an e-collar without this video. I have trained dogs for nearly 40 years and have never used an e-collar. Recently, I tried a very nice Garmin e-collar with this video and can see that it can be used as a gentle reminder to the dog (and should never be used as a punishment). Just a soft stimulus produces results. Good video and audio quality. Excellent instructions from Robin. She trains humans to train dogs. This is basic stuff, but well worth reviewing each time you start with a new dog or puppy. I'll recommend to others who want to use an e-collar for training. Already had a dog that had a good grasp of all the basic commands and the video with a collar just brought everything together. "Very clear, easy to follow basic instructions"
Very clear, easy to follow basic instructions. I also like the fact that she uses untrained pups in her videos. The Garmin Sport Pro is easy to use and very effective. It is an excellent tool for getting the dog's (particularly a 6 mo. old Lab) attention directed to the handler. One suggestion for the video: Please date/time stamp each segment of e-collar training video. What may appear as a perfectly trained dog within the first 5-10 minutes of using the collar, is likely pieced-together video over a period of weeks or months. The belt loop clip could be shortened in length, eliminating the need to remove the clip (difficult) prior to charging the hand-held remote. I particularly like the "night light" for training in the evening during periods of the year with short daylight hours. Professional. I especially liked the visual blinking light when stimulation was applied. I have two dogs and the training is so easy. They learn that when they hear the sound it is time to follow commands. The dogs are a male Golden Retriever and a female Daniff. They are both very smart dogs. People comment on how well they mind and it has been because of using this great tool! The presenter did an excellent job sequentially demonstrating the way to train with the Ecollar. She was clear and easy to follow and understand. This is an excellent video for anyone who has very little knowledge. I felt that it was only a little bit of a help for me because of my previous knowledge with e-collar training. Great collar, easy to use. I learned several things and really liked the video when a dog is under a real hunting situation they are a little more distracted and you could see how the trainer uses the e collar, when the nose is on the brain is off! Very good info on training for beginners. Thanks, Steve. The guidance on how to gauge the intensity of the collar impulses with the reaction of the dog is key to use it humanely. Excellent, very informative and educational video. Ms. Robin MacFarlane is an excellent trainer and teacher. The way video has been created it made very easy to understand the idea behind the e-collar training. Repetitions in a variety of situations with different dogs helped me a lot to understand and follow instruction. I have never used e-collar in the past. Watching this great training tool helped me a lot to be able and train my dog. Without video, I would not be able to know, how to even start using this collar. I sincerely appreciate that this video has been included in the e-collar package. THANK YOU A LOT! The video was extremely helpful. Before watching we were hesitant to start off our 11 week old Brittany with an e-collar. We followed Robins video along with some good Garmin videos and have been very pleased with results and improved behavior all around. Good training DVD for beginners! It was good, Cash particularly liked watching with me( ha, ha). But I had trouble getting repeated behavior beyond the first few basics without continued hits. After the first few times cash would just shut down and continued correction was just torture. Need to go a little deeper explaining things like that. Used many of the techniques, as with most training videos, you take what works for you and your dog and use it! Good information but seems repetitive, Same basic training information but in different situations. Basic overview. Good start for the person who never used an E Collar before. For me it was mostly just a refresher on basics, but I did learn at least one new trick, so it was worthwhile. I already see good results. Vizslas are very active and sensitive. They don't take well to training that is harsh or too stern. McFarlane's method is really useful for breeds like this. The video's focus is on training your dog to be a good pet. I wish she would expand her technique into specifics for retrievers and pointers. Simple and dogs respond to it. Also Robin is beautiful. Basic is the key word. It offered good discussion points, but not nearly as robust on actual training methods for the different commands or problem solving issues with duration, distance and distraction. I got more from free Internet searches on the topic than from this $40 video. Had to search for a DVD player. Really found the Garmin videos more helpful, easier to access. Pretty basic information. Not worth $40 in my opinion. After watching the DVD I would say it's worth more like $25. If there was a series of DVD's that covered basic, intermediate and advanced instruction I think it would be of more value and would be worth more. The DVD has some interesting points. I think that the DVD is over price for the material provided. I didn't realize that Robin used the collar to train the dog. I prefer to use only positive reinforcement to teach the dog, and then reinforce with stimulation. Tritronics had a better one. It was okay for just an intro to ecollars video. I did not use it. My dog was already collar condition. It didn't cover the most basic rule of thumb for e collar use. The dog must understand what is being asked of it before you use any negative reinforcement. It was too much obedience training and not enough hunt training. You don't just fire the collar on a start juicing a dog. The whole video was painful to watch and my other retrieving friends agree it does not show the correct methods at all. Over 5 HOURS of Obedience Training! Do you have an e-collar for your dog but you've been afraid to use it? Stop worrying and start training! This 5-disc set will take you step-by-step through the process, from starting the training and finding a level up and through working around distractions and being ready to go off-leash! Three dogs of varying personalities were adopted from a shelter environment and trained daily over the course of 3-weeks. 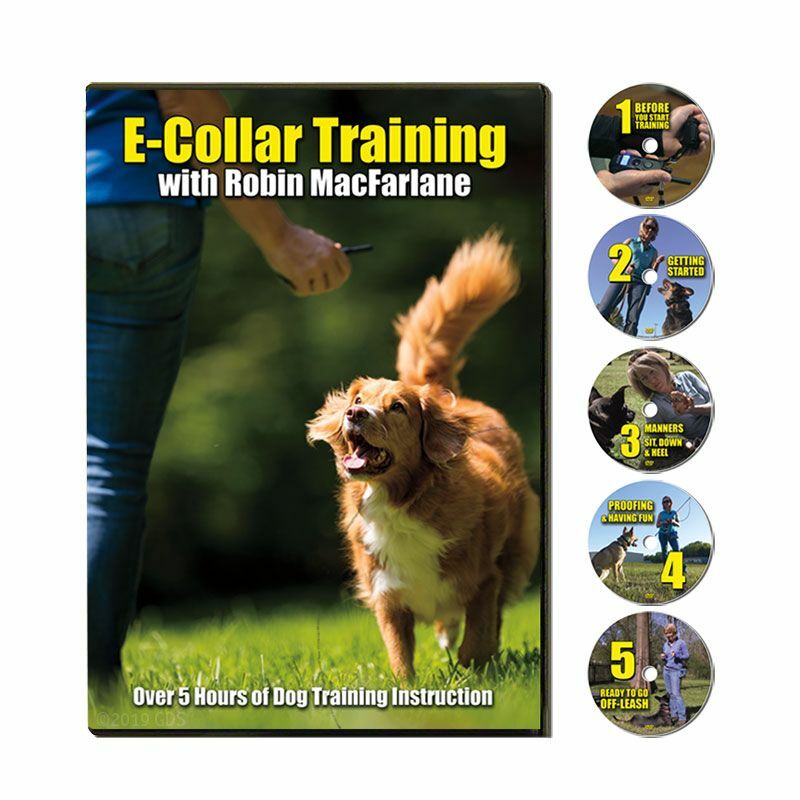 This DVD series captures the real-time footage starting from day one of introducing the e-collar and progresses to the point of off-leash control and working around real world distractions. 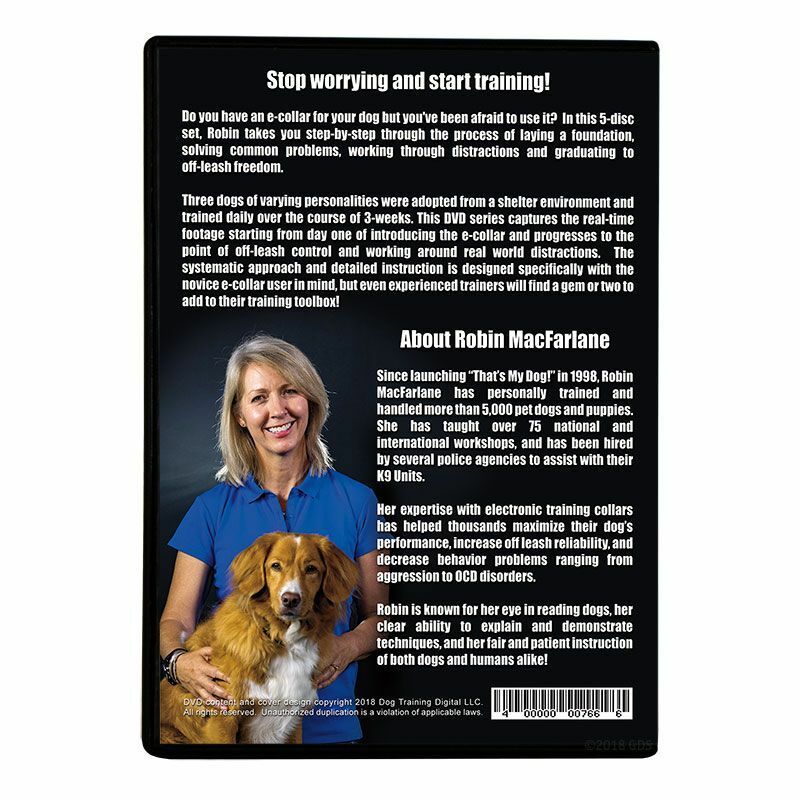 Robin takes you step-by-step through the process of laying a foundation, solving common problems, working through distractions and graduating to off-leash freedom. The systematic approach and detailed instruction is designed specifically with the novice e-collar user in mind, but even experienced trainers will find a gem or two to add to their training toolbox! Each of the dogs in this video series, Grace, Brandi and Bonnie, started training within 72 hours of being adopted from a shelter environment. What you will see are real-time training sessions, not special editing or previously trained dogs. Viewers will be watching dogs with different temperaments being worked through challenges toward the goal of off-leash control and a greatly improved relationship with their handler. This video series takes a systematic approach to e-collar use from introduction to off-leash control. Robin's e-collar instructional materials are clear, concise and never sacrifice the physical or emotional well-being of the dog. With this training, your dog will be calmer, more controlled AND be able to experience the joys of off-leash freedom! When Do I Start Using My E-Collar? When Do I Start Using Verbal Commands? When Do I Stop Using the E-Collar? If you've longed to be able to trust your dog off-leash but don’t have the confidence to start training with an e-collar, this video series is for you! Any dog owner that is interested in learning an easier way to communicate with their dog while gaining off-leash reliability will benefit from this DVD series.